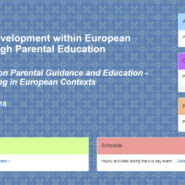 European Days is an international conference which proposes academic presentations, workshops, interventions and case studies in the field of support and implementation of parental guidance and positive parenting. The aim of this conference is to inform and train professionals working with children, parents and families in social work and education and also to share the field experiences from 5 countries (Romania, France, UK, Italy and Spain). This event is part of the Erasmus+ PAGE (Parental Guidance and Education) Project, which is initiated by the Caminante Association, France. Click here to visit the event page for detailed informations.